When I first moved to Rwanda, I was not sure what to expect. It was March 2015, and I was moving in with my boyfriend in Kigali. Of course, I knew the city would be clean and green. I had heard countless success stories about economic development, and inevitably, I knew a lot about the genocide. Still, I felt like there was so much more about the city that I would soon discover… So I went with an open heart, without much expectations, ready to learn more about the local culture, and most importantly, meet the people who make the place. I let myself be surprised by the sights and smells, the colours and sounds, the foods and traditions, and the little things of everyday life. 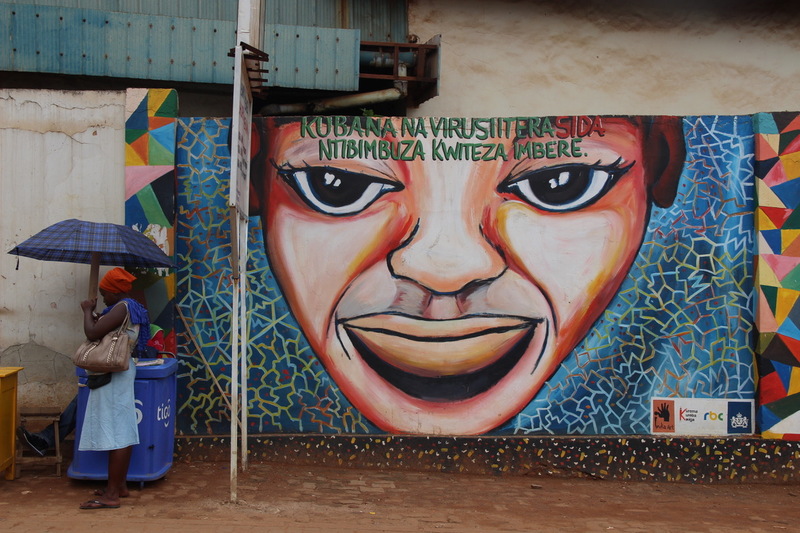 A ‘Kurema Kureba Kwiga’ mural addressing the stigma of positive living and HIV/AIDS in Kigali. Soon, I started meeting artists, musicians, fashion designers, dancers, photographers, and what not. What they all shared in common was a strong drive to use their art to bring about positive change in the country, a determination to challenge mentalities, move forward and grow. They also wanted to put Rwanda on the map. Most were young, and self-taught with such ambition that their presence alone made me feel inspired. Some were born in Rwanda, others were Rwandans from the diaspora who had decided to move back in the last few years. When talking about their respective art, or when practicing, they had sparkles in their eyes. Behind the scene. 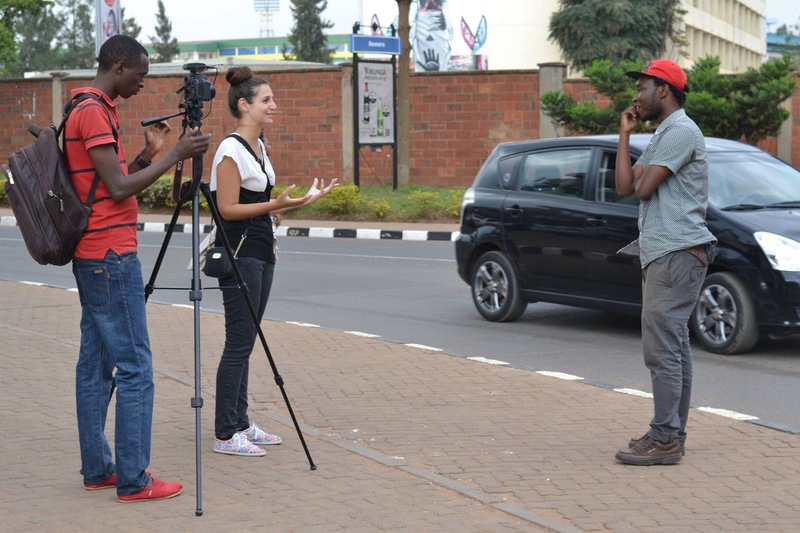 Interviewing the young photographer Jacques Nkinzingabo. Yes, it is them who touched me the most. They inspired my writings, and made me want to grab my camera as fast as possible to create together with them. Even now, writing this article from my living room in Brussels, I am realising how much I miss them. I strongly believe that art is a universal language that brings people together. It is a powerful tool to communicate at an emotional level with the people within your own culture, but ultimately, it transcends all cultural boundaries. Art speaks directly to our shared humanity. It is through the arts, thus, that I felt most connected to the Rwandan youth. 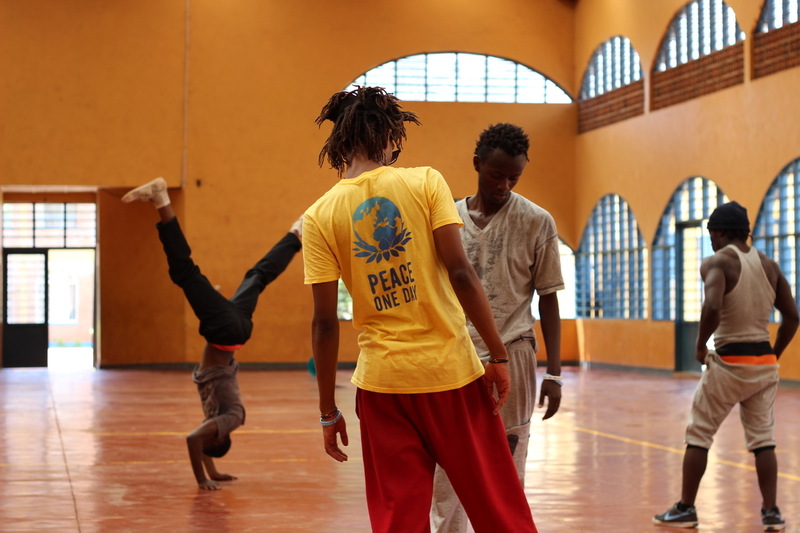 Krest Crew dancers practicing at the Kimisagara Youth Centre in Kigali. 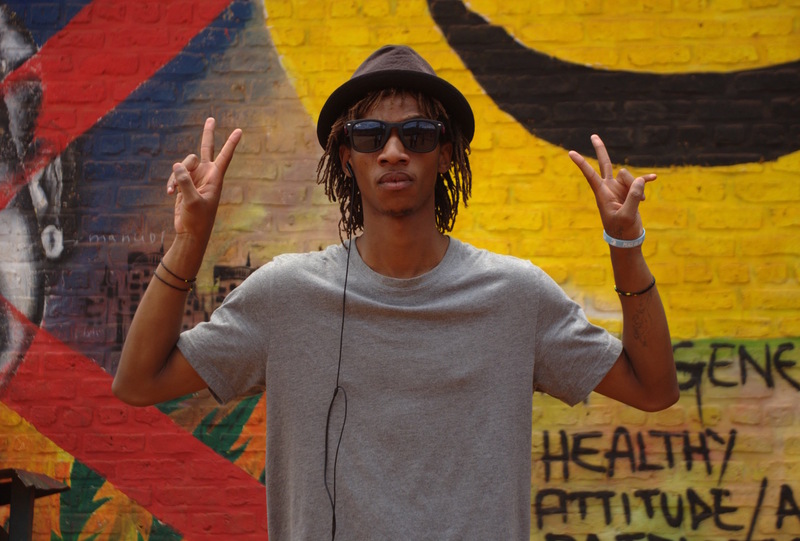 In Rwanda, I lived the life of a writer and visual anthropologist, writing about the arts and culture scene, about the people who inspired me, and working on my baby; a documentary film called ‘RWANDArt’ that I directed and produced. This documentary is born from a strong desire to show the beauty and creativity of the people who make the place, and to document the early stages of the creative industry with all its challenges and opportunities. It is the result of my everyday interaction with young and talented Rwandan creatives defying traditional conventions through music, dance, fashion and art. There is no voice over in the film, a deliberate choice I made to give artists the space to speak for themselves. Also, I collaborated with local talents for the original soundtrack, cinematography and post-production work. 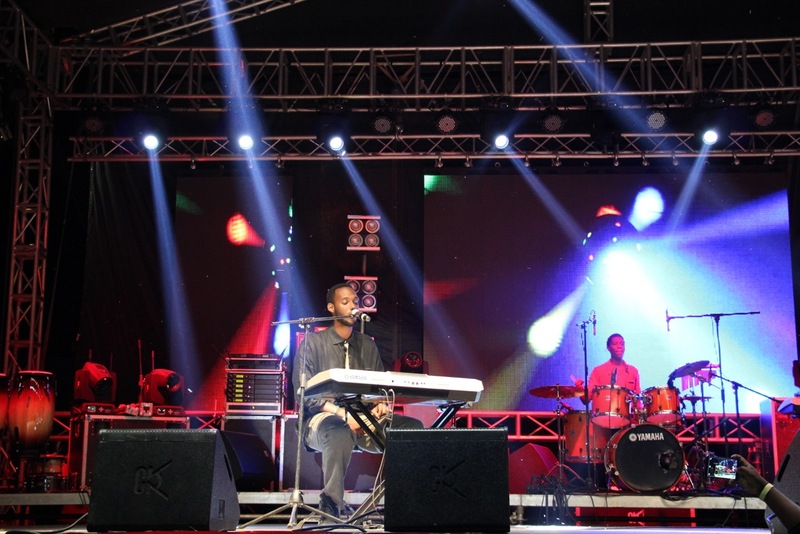 Mike Kayihura, a self-taught R’n’B and soul artist, on stage. I could fully relate to what artists were speaking about as this was also my experience in the country. Challenges were shared and common in the industry. It was hard to find money for your art. Your art was not always understood. Many kept trying to convince you to get a ‘real’ job, thinking that art could only be a hobby. Professionalism was sometimes lacking, as were the schools to learn the skills, and what not. But even though challenges were real, as in any other country actually, creative entrepreneurs were determined not to give up. Where there were challenges, there were also opportunities. 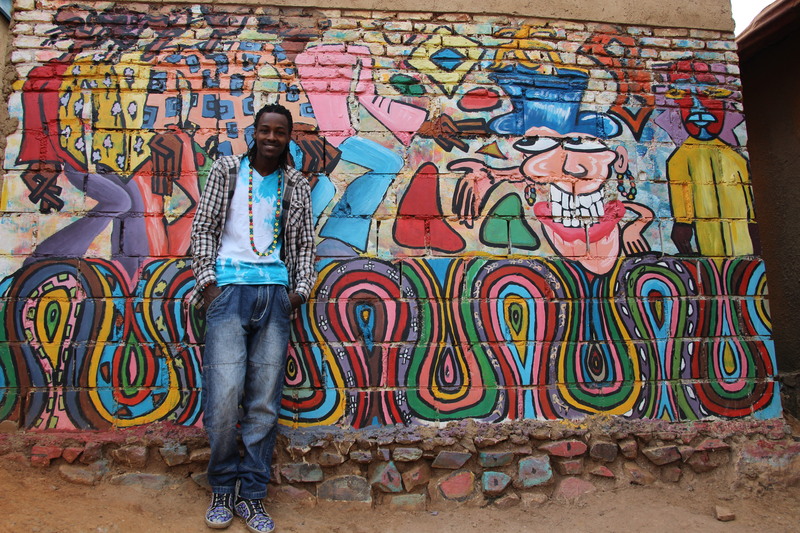 Chris Hirwa, the hip hop dancer who uses his art to improve the lives of orphans and street kids. The fact that the industry had just started two, three years back from the start of my filming, meant that there was so much room to create since not much had been done yet. You could do whatever you set your mind to. You could truly innovate, and see the results of your work. In fact, opportunities were endless, and outweighed all the challenges. It was incredible to experience that. The country was growing at such a fast pace. Things were truly moving in such positive ways, and the youth had understood very well that innovation and creativity are key elements in promoting a country’s economic and cultural development. Bruce Niyonkuru, the talented contemporary artist standing in front of his work. RWANDArt was completed in July 2016. It premiered in Kigali at the Rwanda Film Festival, and was then screened in other countries. I am extremely grateful for the positive feedback it received so far, but more than that, I am grateful for all the laughter, friendship and trust to enter the creative circles, the long hours of work until sunrise, and even the occasional sorrows. This documentary film is truly about the people; the Rwandan creative youth that is the new face of the country. Its heart and soul. When you look at them, full of passion, dedication and ambition, it becomes clear that the country has a great future. Sarine Arslanian won the Hugh Brody Runner Up prize for a project on Armenian music in London that she did as part of SE555 Visual Anthropology Project. You can learn more about what she has done since graduating with a BA in Cultural Studies and Social Anthropology on her website. See a previous post by Sarine here.